Recycled Plastic Wood, also known as Recycled Plastic Lumber or Recycled Plastic Timber is a raw material, made from unwanted and scrap plastics. It can be made into a variety of products, which will literally last a lifetime. In 2011 a group of enthusiasts in a London street managed to get funding to build two raised herb beds for community use. They researched the project thoroughly and in the end decided to go for a recycled plastic solution with profiles supplied by Kedel Limited in Colne, Lancashire. What is Recycled Plastic Lumber? It’s rot proof, impact resistant, and impervious to green algae and moss. Plus, graffiti can simply be wiped clean, as paint cannot stick properly or penetrate the plastic. 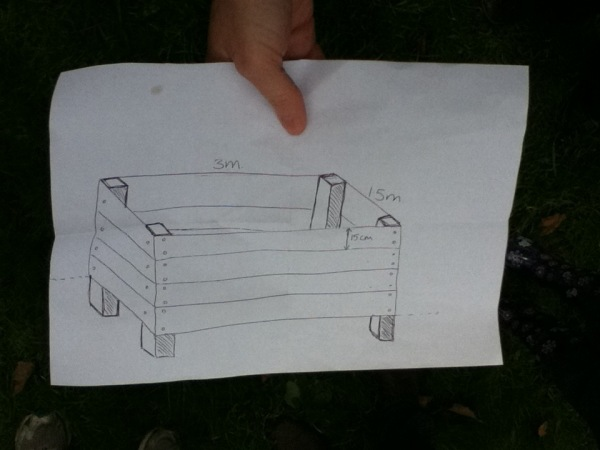 Kedel looked at the groups carefully drawn plans (shown left), and gave some advice about which profiles would be best and the best way to construct such large raised beds. These raised beds were quite high to allow older and disabled people to get easy access to the herbs with no bending down necessary. The organisers were delighted to get such good advice for free and even more delighted when the mixed plastic profiles arrived on site. They were tough, durable, and easy to work with normal woodworking tools. Besides being environmentally friendly this material looked like it would stand the test of time, with a life span many times longer than wood and without the need for any treatment to keep it looking good. So Here Are 18 Good Reasons to Use Recycled Plastic instead of wood! And it looks cool too! It’s like this sleek space-aged wonder material. Any other advice to would-be raised-bed-builders? Yes! These beds included a permeable membrane over the soil to let water into the bed but prevent it from drying out, and fortunately it seemed to work well, as rain was the only available water source. Just cut a hole in the membrane to put in your plants and you’re good to go. 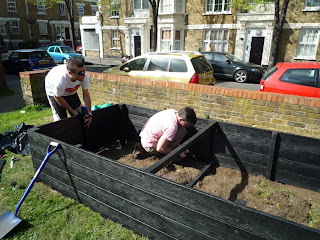 Where can you get your recycled plastic raised bed materials? Kedel Limited seem to be a good place to start if you need good advice and friendly people you can talk to. They even sell ready made recycled plastic raised bed kits.